Milan is universally recognised as the economic capital of Italy, but it is not just about business. 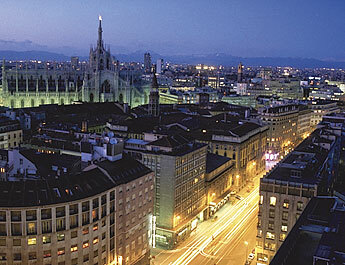 Milano is also a city of art, design, new technologies, culture, music and fashion. Historical buildings, villas, monuments, modern-architectural structures and churches all offer a variety of styles and striking details. Masterpieces of Italian and International art from every century enrich the museums, “basilica” and buildings of the city. A myriad of live music venues and stages, small art-house cinemas enliven the Lombard capital with the spirit of initiative that also plays a role in new expressive arts, and in the talent for local gastronomy. All these aspects are drawn together in Milan to create an inherent energy within an environment of natural creativity and the desire to evolve. With Emma you can discover the real character of this Ambrosian city and its surrounding areas. As you unlock the doors of this distinctive city and its surrounding areas and learn the language of the people who live and work there. Whether your passion is Music, Fashion, Shopping, Heritage or Artisan you’ll find a unique Made to Measure hands-on experience which will meet your desire for cultural enrichment and natural curiosity. The road of the Cistercian Abbeys traces an original route which not only displays their importance as architectural and artistic masterpieces, but also illustrates how they played a crucial role in agricultural development and the design of the landscape. The Abbeys located in the southern part of the province, give a whole new meaning to the concept of cultural heritage by creating a stimulating interaction between the discovery of these treasures and the cultural and territorial context in which they are placed. We are in a territory which, as early as the Middle Ages, saw man’s endeavours modify the connotations of the landscape. Water is plentiful in this part of the province and over the centuries the territory has structured itself around this primary resource. The Parco del Ticino (Ticino Park) also boasts highly developed agriculture and its landscape is distinguished by the Navigli, water meadow irrigation canals, Lombard farmsteads, mills and rice fields. Many companies have joined the “Parco del Ticino – Produzione controllata” (Ticino Park – Controlled production”) project that certifies products that can be bought directly from these companies. As means of transport, Emma advises the use of bicycles and exploration on foot, the typical expression of movement of a bygone era whose benefits are recently being rediscovered and enjoyed.